The client is one of the oldest curling clubs in Ontario, Canada. Established in 1838, and having been in continuous operation since then, the club boasts a full range of leagues for both those who are new the game and seasoned curlers, with a membership that ranges from ages 6 to 99. 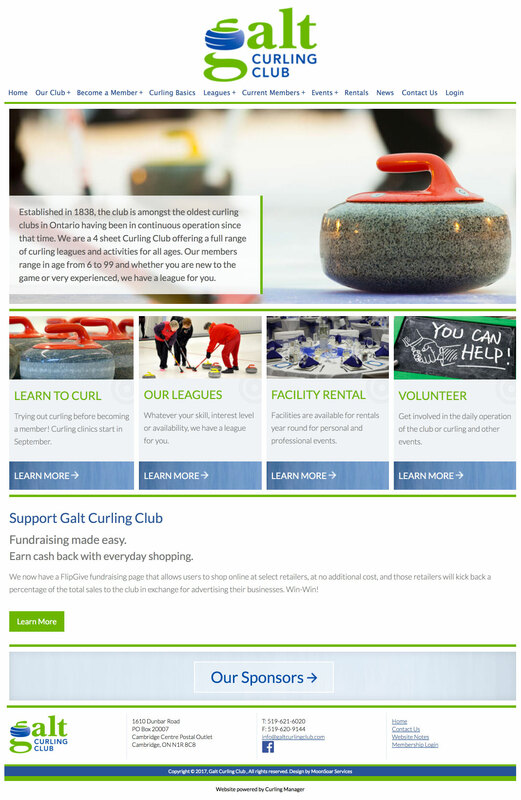 The not-for-profit curling club’s website was long overdue for a redesign. The client wanted a new design for the website that was contemporary and fully responsive. The age of members in the club ranged from children through to seniors, with the average age skewed towards the older end of the scale. For this reason, the website needed to be very user friendly, easy to read, with clear navigation. As a good number of members on the board accessed the website via mobile devices, the website had to be fully responsive and easy to navigate on phones. In addition, the website still had to be used to attract new members. We created a design that was clean, with large and bold visuals to help draw attention to important information and allow the information to be easily read by an older audience. Subtle transitions were provided to add visual delight to website users. The website is managed by Ricon Consulting Inc.’s Curling Manager content management system, which allowed us to create new pages, create our own stylesheet and add images as needed. There were a large number of system pages that were created by the content management system where how the content was laid out could not be changed, but we were able to style the content so it was more appealing to the audience.